The Genesis Open has called Riviera Country Club home since 1973. The PGA Tour finishes up its five-week West Coast swing as it heads to Riviera Country Club for the Genesis Open. Riviera Country Club has played host to the event on a near-continuous basis since 1973, when the tournament was still called the Los Angeles Open. Here’s everything that you need to know about Riviera. The origin of the course: Golf was becoming more popular in Southern California in the 1920s, and the Los Angeles Athletic Club wanted to build a premier course that was located outside of the traffic and congestion in LA. With its location in Pacific Palisades about 40 minutes outside of downtown LA, Riviera Country Club was founded in 1926. George C. Thomas, who had just finished putting together Bel-Air Country Club roughly 15 minutes away, was tasked with the course design. Despite not liking the course’s location in the Santa Monica Canyon, Thomas put together 15 different versions of the design over 18 months. The course officially opened for business in 1927. The design of the course: The course features four tees for golfers to use (black, blue, white, and gold) and runs 7,366 yards from the back tees for the Genesis Open. The fairways and rough are made from kikuyu grass, while the greens use poa annua grass. Riviera has three par-5’s and four par-3’s. 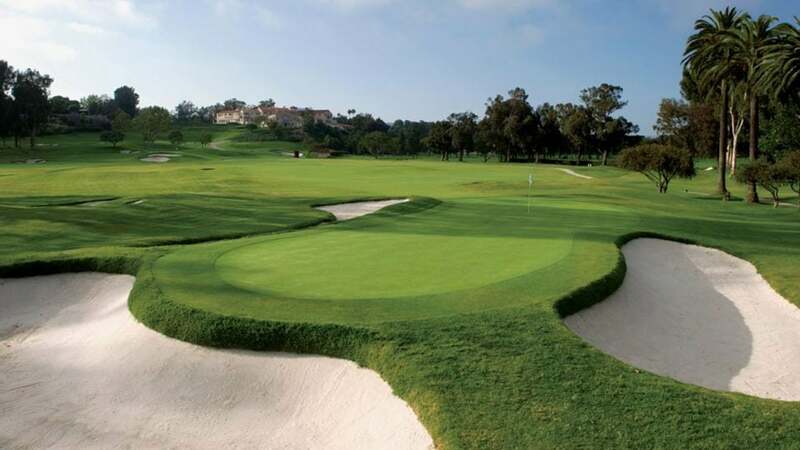 The course has held up well, as it has undergone only one major renovation when Ben Crenshaw and Bill Coore redesigned the bunkers in 1992.
Notable members of Riviera: Because of its proximity to The Entertainment Capital of the World, Riviera has attracted some of the biggest Hollywood stars to the country club. Charlie Chaplin, Walt Disney, Howard Hughes, Glen Campbell, and Dean Martin are just some of the famous names who have been members at Riviera. In fact, the late country music singer Campbell was the host of the Los Angeles Open from 1971-1983. How pro golfers have fared at Riviera: Tiger Woods and Jack Nicklaus are considered two of the greatest golfers of all-time. But one thing that neither golfer has accomplished is win at Riviera. Woods’ first PGA Tour event as an amateur came at Riviera in 1992. Despite being winless on the course, Woods is the annual host of the Genesis Open. Meanwhile, Riviera was one of Ben Hogan’s favorite courses. It’s been nicknamed “Hogan’s Alley” after he won a pair of Los Angeles Opens and the U.S. Open in between in 1948 and 1949 at Riviera. A bronze Hogan statue stands just a few yards away from the putting green, honoring the nine-time major champion. The history of the Genesis Open at Riviera: Riviera first hosted the event in 1929, when Scotland’s McDonald Smith was the winner. Since 1973, Riviera has played host to the event every year except for 1983 and 1998. The event was played about 25 minutes away at Rancho Park Golf Course in 1983 while Riviera prepared to host the PGA Championship that year. In 1998, Valencia Country Club hosted the tournament as Riviera prepared to hold the U.S. Senior Open that year. The history of other major golf tournaments at Riviera: Riviera hosted its first and only U.S. Open in 1948 when the aforementioned Hogan won his first national championship. It has held the 1983 and 1995 PGA Championships. It was at Riviera in 1983 when Hal Sutton won his first and only major championship, while Steve Elkington won his first and only major at Riviera in 1995. The U.S. Senior Open that Riviera hosted in 1998 was won by Hale Irwin, and it also was the home of the U.S. Amateur in 2017. The next big event to come to Riviera: the 2028 Summer Olympics. The course will play host to the golf events of the Los Angeles games. -The shortest hole at Riviera: The 166-yard par-3 16th hole plays as the number 14 handicap. It runs slightly downhill and features a small green that is surrounded by rough, deep bunkers. Tee shots that hit the green should finish close enough to bring about birdie opportunities. But misses will rarely result in pars. -The longest hole at Riviera: The 590-yard par-5 17th hole plays as the number 12 handicap. In contrast to the previous hole, the 17th tee runs uphill and benefits from a tailwind. But it remains a three-shot hole for all but the longest hitters. Tee shots should avoid the right-side bunker, but the bigger challenge comes on the second shot where more sand protects the left-side lay-up area. The green is two-tiered and flanked on the right by a deep bunker, a hazard which defends any back-right pins. -The iconic hole at Riviera: Arguably Riviera’s best hole and one of the great short par-4’s in the world is the 315-yard 10th hole. Playing as the number 16 handicap, the 10th hole’s key is the short game. The putting surface is an angled and narrow target with a volatile right-to-left slope. You can reach the green with your tee shot, but only a perfect drive will land and stay on the green. If your tee shot misses the green, it will likely result in a bogey or worse as several bunkers surround the green. Therefore, golfers should go for the left side of the fairway and set up for a manageable approach shot rather than aim for the greens.